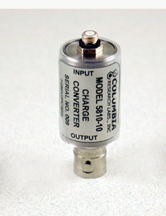 Columbia Series 5810 Inline Charge Converters are designed to convert the charge signal from a high impedance piezoelectric sensor into a voltage signal with low impedance, eliminating the need for costly charge amplifiers in many applications. The device can be used with all Columbia non-integrated piezoelectric accelerometers and pressure sensors. Available in three fixed gain settings of 0.1, 1, and 10 mV/pC, the charge converters require a constant current power source as provided by Columbia Model 5421 (single channel) or Model 5425 (4 channel) Constant Current Supply. Series 5810 Inline Charge Converters are ideal for applications where a low impedance sensor cannot withstand high temperature environments due to limitations of its internal electronics.